Are you looking for a luxurious taxi service to collect you at Amsterdam Schiphol Airport? When you arrive our driver will already be waiting for you to bring you to your desired location. Feel free to contact us for more information regarding the services we offer for luxurious transport by taxi from Amsterdam Schiphol Airport to Utrecht. TaxiLux Utrecht offers you the combination of an economical fare from Amsterdam Schiphol Airport. You will be transported in a relaxed way in one of our recent and luxurious cars. The representative driver is waiting for you and will take you to your desired destination. 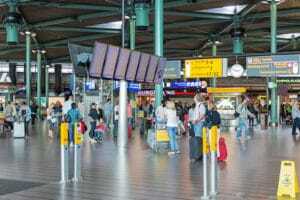 It goes without saying that we can also take you to Amsterdam Schiphol Airport, not just collect you. Our driver will collect you and help you with your luggage if desired. It is important for us that you start your trip as relaxed as possible. End your trip in style while enjoying the comfort of our luxurious cars. The driver will contact you by telephone on the agreed date and time. That way you are sure he will collect you at the correct arrivals hall. Our driver wil take care of your luggage and he will guide you to your taxi. After loading your luggage and installing you in the taxi, you will be taken to your desired destination in Utrecht. Our luxurious taxi service is happy to oblige you. Inform us about your wishes and we will make all necessary arrangements. Contactus on 030 – 879 99 99 or make your reservation online now. "TaxiLux takes care that I can do my work in between my appointments." "The fares of TaxiLux are very good for the high service you receive." "The drivers from TaxiLux are very easy to talk to in a relaxed way. They make sure I arrive at my destination in a relaxed mood."